Over the weekend we got our first snowstorm. It wasn’t much but enough that I had put on my winter boots and do some morning shoveling. I love winter when it’s snowing. The cold, gray, bleak days in March and April kill me. Above and below a few houses decorated for the holidays in Marblehead’s Old Town neighborhood. 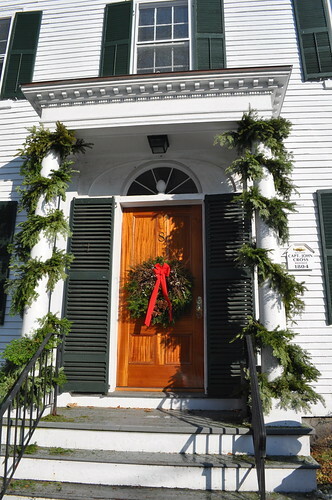 I like simple wreathes and garlands around the door. At the very bottom a lobster trap Christmas tree. 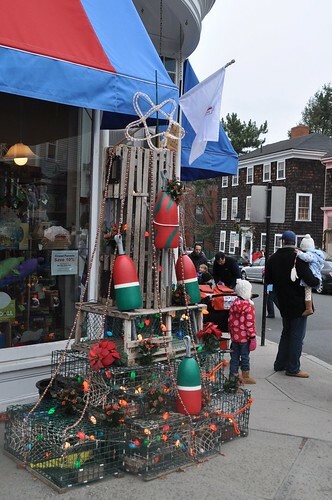 The tree was part of Marblehead’s annual Christmas Walk celebration held over the weekend. Enjoy! Need more holiday door inspiration click here, here, and here. 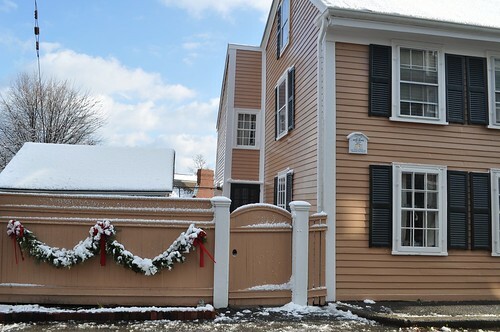 The exterior blinds on the house pictured with its beige clapboards, white trim, and that garland draped over the fence, are not hanged properly. They should be on pintles that are affixed to the window frame and held to the house with forged iron shutter dogs. The way they are now, screwed to the clapboards and hanged UPSIDE DOWN destroys the look of an otherwise splendid house. Thanks for sharing. 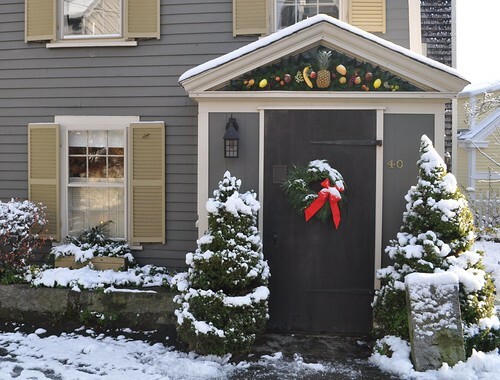 New Englanders are the best at decorating for Christmas I think. 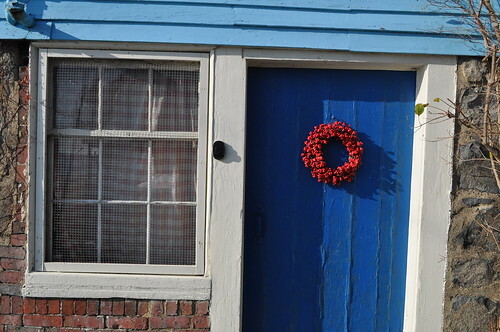 I also was struck by the blue door with the red berry wreath! Everything in winter looks better with a little snow. We just got our first measurable snow here in Chicago this morning! Gorgeous! I adore the blue door with the red wreath especially!